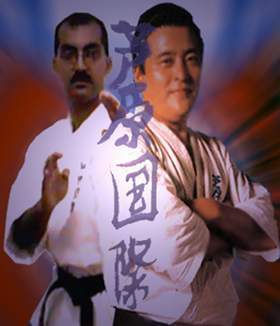 I have watched the video tape, it is very interesting and give me a lot of good ideas about ashihara karate movements. I think it will help me study ashihara karate. The documentation takes a little bit time to study but I am working on it. I am very impressed about your demonstration with the red cross car, I think it needs a lot of concentration, how are you working on your concentration? Do you have some special exercises to improve your concentration? South Africa is beautiful. It looks like Hawaii without the crowding. I wish there had been more of your karate on the tape. Your system looks to be very interesting and very different in concept from the Shito-ryu I've been trained in. I loved your basic kata: is that something that you created? Would you mind if I incorporated it into my system? One of the complaints I have with kata is that so few of them have kicking in them. The principles of your kata seem to fit in with the principles of our system. Thank you again for the tape. If you ever get to the U.S., you have to promise me that you will do everything possible to come to the Northwest and stay with me and train with my school. Thank you, I received the tape a couple of days ago. It's wonderful! I have received the tapes and manuals that you sent. Thank you! You asked me for my comments and they are provided as follows: I am enjoying the tapes very much. 1. Having been in kyokushinkai for years the basic techniques are familiar to me. 2. The Ashihara specific techniques were good and valuable to me. 3. I think the katas are practical. 1. Techniques are demonstrated clearly and are easy to follow. 3. Your techniques are crisp. 1. The reproduction is only fair. You are open and are willing to share your knowledge with others. You believe in the unification of martial arts and techniques ... at least in a general sense. I hope to view additional tapes in your series. I am anxious to learn from you. I got a pleasant surprise at the mail box today. I got the tape, some awesome footage there. I like your goods and tapes. I am interested in all the goods you sent!! Great technique. I really enjoyed your video, sabaki and appreciated it very much. It really shows the technique. I teach Kempo karate and Taekwon do. I wish to convert my small home school into ashihara. What I'm asking for is your assistance. I understand the technique and comprehend the method, I just wish to know if I start from your basic blue belt tape can you assist me in cameras videos right from class over kata, kumite and different pad drills? ? . I've been in karate for a long time and haven't seen anything so pure, simple and effective - that one video isn't enough. I've been over it a hundred times and I just feel the system is what I'd like to teach. I just wish your school was here, so that I could attend everyday. I always wanted to change the kata to a more self-defensive form and was even thinking about starting my own style - that's until I saw sabaki. I have collected and watched the video .... needless to say I was very impressed and found it very informative. I especially liked the demonstration of sabaki kumite and the application of the kata's. Please inform me of any other video's you may have or may be producing soon. I would like to thank you for sending me the Ashihara tape. It was very impressive with much spirit. I was surprised at the running time. I especially enjoyed the kumite footage. Greetings ! I received the blue belt video yesterday in the mail. Thank you. I especially liked watching your match with Kishi! but I thought the decision was a bit um . . questionable. That's the way it goes though. I also liked how you ran Seipai .... very cool. Your version of Kanku Dai is a little different than our own. Do you still do these Kata? Thank you for sending the Blue Belt Tape (part 1). I enjoyed it very much. The instruction was clear and well organised. The demonstrators were very powerful and a credit to the system. The footage of you at tournaments and demonstrations (especially the car roll-overs) was very interesting and impressive. 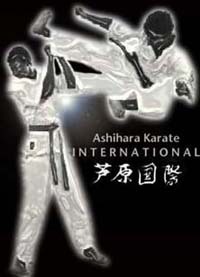 Best wishes to you in spreading Ashihara Karate. I have now reviewed your tapes and manuals several times. The material is AWESOME. Only thing I could ask for is the image quality of your instructional video. I guess it could be possible that the conversion from PAL to NTSC might reduce the image quality? I watched the video Cassette which is nicely made. I was really impressed to see your Dojo. You have dedicated lots of time, money, emotions and everything. It has been a pleasure to watch you on the video and wishing to see you in person now. I will write to you soon regarding a more thorough feeling regarding the video. Plainly stated I enjoyed the entire video, it was well done. Thanks for the video. I received it the other day and it was way more than I expected. I didn't expect the Ashihara testing coverage but it was greatly appreciated. Thank you. It is very similar to the Enshin Karate that I've seen. Good training. I've been through the blue belt part of the tape. I like the yakusoku kumite illustrating the grab and hold. I have no problem with teaching them, though this sort of thing generally goes against the basic precepts of Kyokushin only from the point of view of holding as part of the basics. No problem with it in a street fight. I also watched some of your tourneys. Very humble of you to show even the ones you lost! However, in one of the others, you did a sweep which won you the match. We are always taught that the sweep on it's own is not enough. Obviously the rules permitted that in that match. And of course, in the one you lost, a Kyokushin match would have disqualified competitors for those holds and throws e.g. the one that lost the match for you. Still, I only see this as a variation of the match rules, which in Kyokushin in the past (and probably now too) unfortunately influences the emphasis in the training. Thank you very much for the tape which I finally received. The tape really helped me to understand better the information you sent me in the manuals. The kata is more clear to me now with the tape. I will be practising for a while and see if I can introduce what I learn to my students. I will keep you informed of my progress. The tape also helps me to know you better because it shows different faces of your life (doing kumite, teaching, interview, demonstration etc..), and I thank you again for allowing me to know more about yourself. I am really interested after I saw the first tape in buying the others tapes from you. The tape I got, included at the end a piece of a tournament, I was very excited to be able to watch the Kumite competition, however the tape end with the Kata competition. 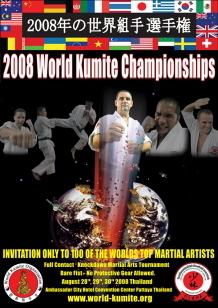 Do you have a tape that shows International Kumite competition?. I saw some fights on the tape and I would like to watch more especially the different styles competing together. Wishing you all the best with your organisation. OSU! Osu Shihan :- I enjoyed the tape. I saw you in action and I liked it. You didn’t loose your condition, I love that. Now, Ill call Shihan Bustos to look at it, and he will send you an E-mail. Thanks for sending me the tape. I thoroughly enjoyed seeing all of the different techniques and clips from tournaments. It was great seeing you ... now I can put a face to the name. You have put together a great video for the students. Like everyone, we have had the idea in mind for sometime, but you have actually done it! I thought it was well done indeed! So congratulations. I have now seen the whole video and really enjoyed it. Your karate is different to mine in Kata and other things, naturally, but I am grateful for the opportunity to see what it was you were describing in regards to the Kata and sabaki, etc. I think you're doing a wonderful job there, the video was great, I wouldn't want to have cars drive over my stomach these days: ) but that was great promotional stuff. I enjoyed your bouts as well, you were a good competitor all right! I watched the tape! Very nice, my favourite was the Sabaki kumite - circular indeed! I'll try to learn it. Our approach would generally be considered linear, while a lot of emphasis is placed in body shifting in our Ippon kumite drills but not quite as circular as yours. I really liked the clear, down-to-earth approach of your kata unlike some of the many not readily explained techniques of Shotokan kata. But Senpai, the names of the hand waza were TOUGH, we BKC guys would faint at names like those ;-) ! Footage - lots of fun watching that. In kumite, Ashihara karateka gives me an idea of our full-contact times. Senpai, there was a footage showing you against a Japanese (sorry, can't remember his name plus the sound wasn't clear) in which the match started with breaking a stack of something - what were those, how many? Is this still practised today - to what system is it unique? If a person couldn't break the stack, then what? Ah, the demonstration involving you being driven over by a vehicle- nice! Must've been pretty cool being on the news after that :-)! Hmm, there was also a footage of a really small kid (remember?) in the tournament, poor guy, seriously! Again, THANK YOU for the video - not once did it occur to me that anyone would be so kind. Thanks for the video.. sorry I didn't give you a review of the whole video. I've been somewhat lax and I've received several other videos that I've been trying to find the time to review. I looked at your workout only so far (and all of the Higaonna, Chinen material - thanks again for that). The workout is very similar to the ones that we do at our own club, this surprised me quite a bit simply because of the overwhelming number of similar exercises. One that we don't do, but I will probably suggest is where one person supports the other off the ground and hold the belt. The other does sit-ups at an angle - pretty cool. I'll give you a more in-depth review in the next week or so, bye for now. Your tape is very well done and uplifting, quite impressive excellent workouts. Oh.. I've looked at your Ashihara training video in moredetail, very good stuff. I like the way you've explored some interesting paths in karate. The high, middle and low blocks are good substitutes for the ones that are commonly taught (which I complain about often), and I like the kata that you teach that is one long fight sequence. That kata has a different look and feel to most kata that I see and flows very smoothly. Your students are sharper than almost all the people I see on videos, and I've seen a lot of them. Very nice movement, good focus and they're obviously strong and fit. The bunkai on the video is interesting too, but I find them a little too complex sometimes. I don't know if this is necessarily a bad thing, but I notice a lot of common themes (like hand behind the neck for example) that I'm not sure extends to other belt levels and other bunkai, so I can't comment much more on that. Watching your tape gives us many new ideas for our children’s class. I reviewed the tape and enjoyed it. The tournaments were good and was interesting to see some different versions of kata. You certainly have "been around" in your journeys and have some great experiences under your belt (no pun intended!). I am studying your tape and hope to begin to perform the first fighting kata. I will also try to introduce the kata kumite sequences as a change of pace in the dojo. I especially enjoyed the Sabaki match, I just shuddered at the thought of the shin kicks you received and gave to your opponent during the match. I saw your Blue Belt VHS cassette that you gave me. It was very nicely done. I can see that this particular copy was not the one for final distribution since it has some unedited sections, but overall I was very impressed with it. I think that it would be a very valuable tool for all Blue Belts. Thanks a lot for the Manuals and Tape which will be of great help for me. I like the Ashihara stuff, especially the sabaki kumite. Your enthusiasm for the Martial Arts is commendable. I enjoyed the video you left with me. If I can be helpful to you in the future, let me know. I had a chance to look at the tape finally. I was surprised by the amount of karateka that attend the tournament. I had no idea how big it was. Overally I was impressed. Especially with you getting run over with the van! The Video was fantastic. I have written you a letter and will send it today. And thank you for the video, badges and the key ring. Very nice of you. I did indeed watch the video without noticing that there are some extras after texts. Some?! Loads of good stuff there. It was really nice to see all kinds of video clips. Also from your championships. Ashihara techniques were easy to follow. There were some really good Ashihara fighters in your Invitational Championships. Especially this one guy, who had really good and fast snap on his mawashi geri. He was so flexible that he was in no trouble with opponents five inches taller than him. Your student I presume? Also his timing and stance were perfect. Also you guys kicked with the ball of the foot and that seemed to be too much for some of the fighters ;-) And I think you could not kick to the legs, right? This guy could be even better using a bit more sabaki, or what do you think? Usually he did go straight forward. Anyway great video, have to watch it again today. Thank you very much Hoosain! I have viewed the Blue Belt tape for which you asked me to comment. The tape was great in the techniques it covered and I liked the warming up exercises. For those who are learning directly from the tape however, it would be helpful if there are detailed instructions for each of the techniques presented. For example, for SOTO UKE and GEDAN BARAI as used in KUMITE, one could emphasise that it is a 'gentle' deflection" and not a "hard block". These comments are beneficial to distance learning students because many new Sabaki students have hard time understanding techniques because they have a preconceived idea of Karate being a "hard" martial art. And yes, I have viewed the additional footage which was very entertaining, how many sit-ups do you do every day? I watched your tapes and I think that they are very good. The additional material (tournament etc.) was quite interesting. But for instance, we have no contact tournament for children. it starts at 16. the combinations and kata were new for me. I think it is useful and I will try to add it to our training plan. I think it would be useful for beginners to see the targets of the punches and kicks. Thank you very much for your continuous support. I received two video tapes and enjoyed to see masters showing their techniques. I knew when I heard a particularly loud thud on the door mat this morning, your tape had arrived.. I will write more about specifics in the tape.. but for now just a thank you .. and to say I better go do something RIGHT NOW to persuade my wife that I have been busy all day rather than enjoying myself. Thanks for taking the time to record the extra material. It was very interesting to me. I definitely saw some Kyokushin and some Goju Ryu in there. I think I understand where Ashihara comes from (in terms of personal lineage’s), but I have never seen it in action until I received your tape. I definitely like your two-man applied kata. Very sensible. These seem to give a flow and spontaneity to bunkai that you don't get from the more 'static'' kata and separate bunkai that I was taught. One of the things I appreciate about Wing Chun, for example, is the wide selection of two-man drills - its something we never had in the IOGKF type Goju that dominated my karate curriculum. Your guys also seem like great kickers - is that the influence of your own training in TKD? I am not used to applied mawashi-geris in sparring. I used to train mawashi geri, but never actually found any use for it in sparring (sparring strictly in Goju techniques), so it was nice to see it applied so comfortably by one of your students in his demonstration. The footage of your competitions was great. I forget his name now, but that Japanese fellow you fought in 1994 really meant business, didn't he? Your Blue belt tape also looks very well done and well presented! I will go though the tape 2morrow. Again, Hoosain thanks for the tape! I have watched the tape in it's entirety. There is a lot of neat footage. Although the initial tape(Blue belt) does not have the clean production and pizzazz of the Enshin tapes, it does have a lot of great stuff. What I liked first and foremost was that it appeared to have a great class structure. I am sure I could take a lot of the stuff on that tape and use it in class. I bet your classes are really enjoyable. It is also apparent that a lot of what you guys do is structured. More so than I expected. As I have been teaching techniques to my students I feel they can handle, I get the impression that you have it laid out per belt level. The redirection using the previous blocking hand to guide the incoming strike into the new block was a wonderful surprise. I look forward to seeing this and other tapes/CD's. I was awe struck when I saw the initial footage of the run at the beginning of the tape. Cape Town is amazingly beautiful. The beach shot with the islands in the background and the waves rolling in was awesome. Yes, I have received the video. I watched it Friday afternoon as soon as I got it out of the mail box. I enjoyed it a great deal. Thank you very much. I enjoyed watching how you appear to conduct classes. I would love to learn the kata but I have not found a Ashihara/Enshin Karate/Sabaki instructor in my area. I watched closely and noticed you seem to have an excellent attitude and sense of humility with regards to your training. I would enjoy meeting you someday. Received and watched video yesterday. Thank you for sending the video. I specially enjoyed the kumite between yourself and the Japanese gentleman. Yes, just finished watching it yesterday in fact. Very interesting approach. Question for you; is the material presented for all ranks up to blue belt or just for students testing for blue belt? Also, if you could forward you rank system to me, I think it would help to put the whole content in better perspective. Overall, I like it. good detail, lots of examples. Your Blue Belt tape was great. We here do much of same types of exercises. I like the use of the blocking hand opening up and being used as a Nagashi uke then other hand doing the block. (Noticed on all of your blocking). Opening music was a home song for me. As the name of the song is from a Police show that was in Hawaii sometime ago. "Hawaii 5-0". At first in one technique the students did, I could not see just what they were on about. Then when they did it with partners... like Mawashi uke followed with a Hiza Keri. Do you have tapes for every level? Great! however had to skip it to get to the kumite. Now that was awesome. We're they your students in kumite? Good matches. Did not get to see all as of yet. I will in time. What part of S. Africa are you in? Looks nice place to visit. You have very good students. Strong! Once again, thank you very much for the videotape. It was an eye opener in many ways. For me, personally, it left me with a nostalgic lump in my throat, as I am also still getting used to all these new WTF rules and regulations, and still pine for the good ol' days of real full contact. The first part, the blue belt training part, was very interesting. The entire blue belt program was very precise, with very little room for deviation. Nothing wrong with it, though! However, we tend to be more relaxed, with less emphasis on exact technique, and more on development of personal style. I was very impressed by your personal appearances in kyorogi. Your technique is fine, excellent. Without you getting upset, how do you manage so well with sight in only one eye? With forms, I noticed that you still take part as well. I, personally, hate the stuff. But then, I suppose I am not as much of a purist as you are. I am mainly concerned with sparring and competition. Also, I once again noticed (not having been at a Karate tournament for a while), that you guys seem to be a lot more intense and precise about your kata. Fortunately, our own poomsae are a lot more relaxed. (Taeguek, that is. The original tul I learned, namely the Pyong Ahns and Palgwes, were a lot more intense and structured as well.) I prefer the more relaxed approach, however. I hate it when I see Taekwondoin performing poomsae, trying to make it look like Japanese kata. It completely defeats the purpose for the Taegueks' existence. But then, we are talking about two entirely divergent paths of form interpretation. May I just add that I simply do not believe that nonsense about "if you perform kata a thousand times it will come naturally when you get into a real combat situation." You, yourself, as a Master with experience and technique far superior than my own, should know this by now. From what I have seen on the tape, nothing you did in kyorogi/randori (after having performed kata for over 25 years), even closely resembled forms. What, then, is the real value of forms? Getting back to the tape you sent me. The sparring is fine all over. But what was the 2001 Sabaki like? I enjoyed the tape very much. Thank you! Initially I thought the tape ended after the formal exercises, but was pleasantly surprised there were MORE on the second part. I saw one of the competitions that you were in - must be quite some time ago (a very young fighter and a tenacious one too). I like some of your techniques and, with your permission, would like to incorporate into mine. I was very impressed by the blue belt tape Part I. Maybe because I started my karate-career with Kyokushin in the early seventies. I changed from Kyokushinkai to Goju-Kai with a few black belts who convinced me to change to look into the roots of kyokushin. That is the reason why I became a Goju practitioner since 1976. I found a lot of comparison with the good old kyokushin in some movements which were shown. My idea is that kyokushinkai is changed in a kind of kick-box in the last decade or so. I want to congratulate you with your efforts and good work In favour of the Ashihara Karate International. The tapes are fantastic, the blue belt tape was excellent and the clips of the tournaments and yourself at the end was wonderful. I have started to look at the techniques on this tape and found it very similar to Ryobukai the only difference is the prearrange kumite and this was very good. I am at this moments overloaded with information and find it difficult to ask question because I do not know where to start so I will start to write them down and ask you at a later time. The Ashihara tape was also fantastic, again I do not know where to start but to say that he look much better on tape than in a book so was his students (my apology for not mentioning how good your students look but to say that I envy you). I was surprised to see on the video, that You are much younger than I thought. Those exercises in the "Blue belt training tape" are really very good and are shown in a good sequence. The last gradings which I had were for the brown-kyu belt. I hope it would be possible to receive the following tapes also after some time. Your African film is really very, very good - you can watch and practice it at the same time, it is very convenient. Also, I like it very much, that You try to keep away from politics. I was impressed to see the faces of Your nice students, sometimes I felt as if I myself was doing the exercises among them. Once more-thank You very very much. Saw the extra footage - oohhhh, I wish we could spar together, I could learn so much from you! It's a real joy to watch you spar - your technique is unique and precise. I'm going to watch this over and over - thank you! I have received today the videocassette and the two books you wrote: Student Handbook and Teaching Manual. What can I say? Congratulations, I was impressed by your work, a hard one. Also I liked the many demonstrations in which a car has passed over you. I wish I had the courage to do the same .... maybe one day we'll meet and you'll reveal me the secret. Again congratulations, thank you and OSSU! My husband and I watched your tape today and I must say.... what a great load of information that held! I was impressed that you put so much information on there but am glad to have it also..... I can relate to the level of training you showed for BLUE BELT level. It seems we are on the same page, if not the same 'style'.... I must confess 'Style' is, after all a matter that will be debated long after, I am gone and have anything to add to the debate!! But I am Greatly Pleased to the degree of professionalism that is shown on your tape! And say that I was also entertained as well. In the matter of the demonstrations you give for the concrete breaking and nail bed demo... we also do that particular demo at my Dojang for open house or even sometimes for belt testing on unsuspecting participants who must learn to TRUST their Instructors. But I must say the car running over your chest is one I have yet to see until now. I still need to look over all of the other material that you have sent, and will keep you appraised of my progress but I must say as for everything so far (except for some minor questions relating to positions of shoulders, feet, etc., on some of the techniques shown) I am very Impressed! Thank you for sharing. I'm also wondering in the tourney’s that you showed.... were there not weapons forms? I saw a few demos of the Nunchuks, and a Sai form, but not really any Sword, Staff forms. I also would like to know if there is an ongoing referee type training program or can my rating here be transferred? We'll keep in touch and once again thank you for your continued interest it is most appreciated! Thanks for the Tape. That was great. However, the part I enjoyed most was your fight with Kishi. Personally, I think you should have been awarded the winner. Kishi's attack was wild but yours was more focus. You connected with quite a few good reverse punches. Just to thank you for your kindness and your friendship. I'm excited to receive the Tape (Great one) and the quality of your book (Great finish) and helpful. Great contents and well described. I'll promote it here in Puerto Rico and also to my friends around USA. I'll start to practice some of your techniques if you authorise me to do so. I think are great ones. Now one more question.. How I can obtain more of this kind of tape? And where to buy it? The blue belt video tape is excellent! It is very good for teaching step by step! The Ashihara tape of Master Ashihara is very good too, it is for fighting strategy and much more ideas. I will be waiting for the other kyu belt video tapes when you finish them, Inshallah . I want to thank you for the great video's - very good techniques! Thanks for the package. Received it yesterday but haven't had time to write you back. The tapes are excellent and will help me greatly. BTW, I was involved in Tae Kwon Do back in the early eighties. Moo Duk Kwan was the org. Still its a real nice book. Hoosain, your Blue Belt video is a great start. You knew better than I what I needed, I believe. The production of the tape is first-rate all around. Your form, and that of your yudansha, is excellent, and makes understanding the nuances of the kata and individual waza easy to grasp. I think, between that video and the other, there will be plenty for us to assimilate. With 2 or 3 kihon-no kata under our belts, that may do it. I'll let you know how we're progressing in a few weeks. As an aside, most people overlook one of the greatest benefits of karate .. at least to me ... the friendships. Now that I've seen the Blue Belt video, I feel like I know you better. It's a pleasure. The form and precision of you and your students makes deciphering the sabaki a breeze. Kudos! I have received the program, thank you so much. It is looking so great. I will start the program right away. I've watched the video up to the combinations. Very impressive! You must be very proud of your students. It is interesting to see the differences between our two styles. While each technique is recognisable, every one is also quite different. I watched the video over the weekend. Excellent video. Applications are excellent and well presented. Your footage at the end of the tape is also very interesting. I can actually improve my knowledge in martial arts. Yes, I have very much enjoyed the blue belt video. Interestingly, many of the exercises demonstrated on the tape are similar to those practice in Yoshukai, although Ashihara seems to employ kicking much more than my system. Yes, I've continued watching the tape and have enjoyed seeing you in tournament! Very impressive.... You did a wonderful production on the video and I would love to acquire the next in the series (if available). Yes, I have seen some of the kata's, it is excellent to see you perform. I have seen your tapes and it was really good. You even had a clip from Hengelo i Holland 1993. I saw my self at the fighting with the black belt. I remember I did some sparring with a guy from Singapore who took black belt. It was the same year that long tall Sam Schillt graduated and you join the Ashihara International with Dave Cook. I was one of the Brown belts who had to stand in front of everybody and show freeze drills, if you remember any thing from that camp. Yes, I've continued watching the tape and have enjoyed seeing you in tournament! Very impressive.... Interestingly, again, I thought I saw you perform Seipai and Seisan gata? Is that correct? Does Ashihara incorporate goju gata into its system? I thought I remembered reading Tadashi Nakayama's book in which he stated that they did geki sai gata, but didn't remember his mention of the more 'advanced' goju gata in the system. Hey, I got your video tape yesterday! I've only so far watched about 15 minutes of it, but there're a few interesting things that are keeping me glued to it. Also I can't believe how productive you are. Amazing. :-) There are of course similarities and differences between what you do and what I do ... as is to be expected. Also your use of Japanese terminology is to be highly respected. I made the decision a long time ago to convert everything to English. Made a lot of sense to me. My students and I absolutely loved your video. Especially the stuff you recorded at the end of it. Very very entertaining. In fact, I saw one of your opponents in another sabaki competition some time ago. Great job. Let me congratulate you and your team. I'm deep impressed by the fine and clear quality of your teaching! I'm watching the videos over and over again, learning and absorbing as much as I can. I like both of them very much; they are very impressive, especially the application ones. In fact, I'm planning on buying the next series of the DVD's within the next week. I find the Sabaki & Blue Belt Part 1 DVD very interesting and instructive. Thank You very much indeed. I was very impressed by your student’s performances on the DVD. I also enjoyed the kata bunkai at the end of the blue belt session. What I saw from your video is very good techniques that are obviously effective ... which I plan to review again and go back to doing many of the things I saw. So I think it was quite prophetic. Thank you my friend ... if you need an endorsement of the videos you can sure use my name if it means anything !! Let me give you my feedback about the blue belt tape, part II: They are excellent, you are a serious martial artist, from world top, and your team is very good and disciplined. Technically the tape is clear and understandable matter all round. I want to thank you Kaicho from the bottom of my heart for the package you've sent me. I was so nervous when the mailman gave it to me. I noticed you sent me two cd's with a training program for 8 kyu: I shall find a way to introduce it in my trainings with the students as preparation for their next examination (which is for 8 kyu). Maybe I am overreacting, but I'd like to say that Santa came to me today. Anyway, thank you once again. It's a great honour for me. Kaicho please excuse me for not posting much sooner. I know I should have done it long time ago, but it took some time until I viewed them. And also it took longer because I gave them to my Sensei to view them as well and I waited to find out his impressions on the videos you've sent me. My Sensei, who is one of the branch chiefs in Romania and the Ashihara Karate representative in Romanian Martial Arts Federation, was very interested when found out that I received these videos from you. He saw them and was very impressed. Everything impressed him: from the techniques presented to the quality of the filming. A very good training guide for serious martial artists. Thank you very much, on behalf of me and my Sensei for those videos. A respectfull Ashihara Karate student. Osu! The manual and Blue Belt DVD arrived this morning. I have had a quick look at work this morning. All looks straight forward, just a few differences in stances & preparation when practising moves. Do you have pictures for the Kata to go along with explanations, these are the only things that will take time to learn. After watching the movement and speed of Ashihara I have allot of training to do. 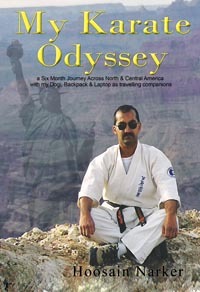 The Ippon Kumite & Sabaki Kumite are great, and I have done allot that is very similar. Hoosain, from watching you on the DVD and reading your biography, I can see and tell that you truly have great passion and love for Karate. I would feel very comfortable learning from you.I look forward to the day I come to South Africa to do my Dan grading. a. A brief introduction by you at the start would be good. Something introducing the Ashihara & the Dojo. This could be brief but will be a good beginning. - He is showing his intention each time. - The technique is not effortless for him. - His power is not coming from his lower abdomen. The technique is clean from a jr. belt's perspective but he is a sr. belt and one would expect better. To contrast this, take a look at your technique execution. Otherwise, I really enjoyed watching the CDs.